Different primary studies in Ethiopia showed the burden of low birth weight. However, variation among those studies was seen. This study was aimed to estimate the national prevalence and associated factors of low birth weight in Ethiopia. 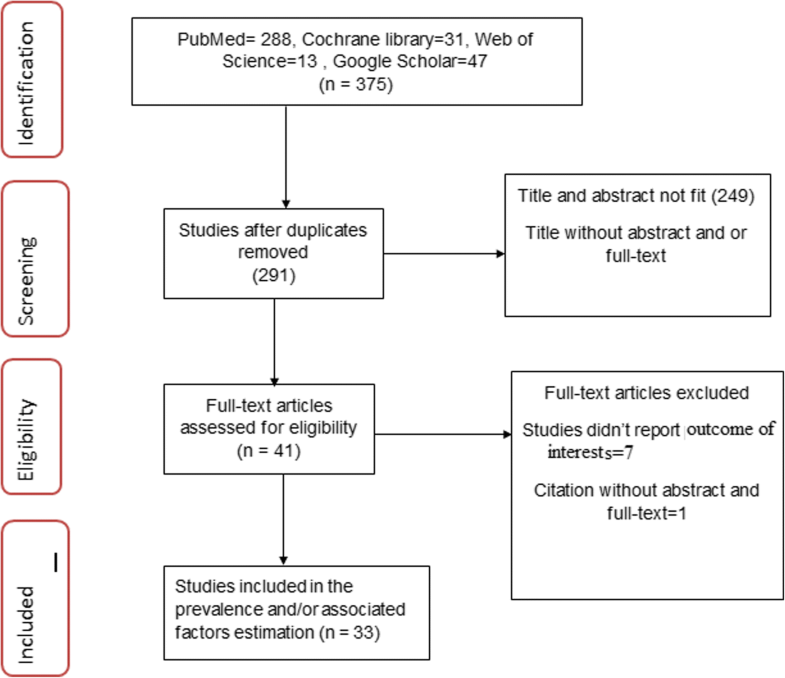 PubMed, Web of Science, Cochrane library, and Google Scholar were searched. A funnel plot and Egger’s regression test were used to see publication bias. I-squared statistic was applied to check heterogeneity of studies. A weighted inverse variance random-effects model was applied to estimate the national prevalence and the effect size of associated factors. The subgroup analysis was conducted by region, study design, and year of publication. A total of 30 studies with 55,085 participants were used for prevalence estimation. The pooled prevalence of LBW was 17.3% (95% CI: 14.1–20.4). Maternal age < 20 years (AOR = 1.7; 95% CI:1.5–2.0), pregnancy interval < 24 months (AOR = 2.8; 95%CI: 1.4–4.2), BMI < 18.5 kg/m2 (AOR = 5.6; 95% CI: 1.7–9.4), and gestational age < 37 weeks at birth (AOR = 6.4; 95% CI: 2.5–10.3) were identified factors of LBW. The prevalence of low birth weight in Ethiopia remains high. This review may help policy-makers and program officers to design low birth weight preventive interventions. Globally, low birth weight (LBW) is one of the major public health problems of newborns  that predispose newborns to many health disorders, like hypoglycemia , hypothermia , mental retardation, physical, and neurodevelopmental problems [4, 5]. Consequently, the risk of death is high in LBW infants. According to WHO’s 2014 estimation, 4.53% of total deaths in Ethiopia was due to LBW . Globally, 15 to 20% of newborns were LBW ; 13% in sub-Saharan Africa , and 15.9% in ten developing countries (Armenia, Cambodia, Colombia, Indonesia, Jordan, Nepal, Pakistan, Tanzania, Uganda, and Zimbabwe) . As a result, LBW executes a remarkable burden on the political, social, economic, and healthcare system both in developing and developed nations. Hence, by the end of 2025, World Health Assembly set a policy target to reduce LBW by 30% . Strategies have been implemented to reduce newborn with below normal birth weight with given emphasis on the packages of care provided at the prenatal, ante-natal, intra-natal, and post-natal period. Despite these preventive strategies, many studies in different settings of the world revealed the contributing factors of LBW as the maternal [9–16], prenatal [17–21], delivery and neonatal [21–25], helminthic and parasitic-related factors [26–28]. Additionally, HIV-positive pregnant women who were on advanced WHO clinical stage of AIDS and having a lower CD4 cell count  were more likely to deliver below normal birth weight baby. Similarly, in Ethiopia, globally recommended strategies have been implemented. Variety of studies were conducted to estimate the prevalence of LBW in this country. However, prevalence of LBW ranges from 8%  to 55.9%  which showed a great variation across different geographical settings and different time periods. Besides, there is no nationally represented pooled data of LBW in Ethiopia. 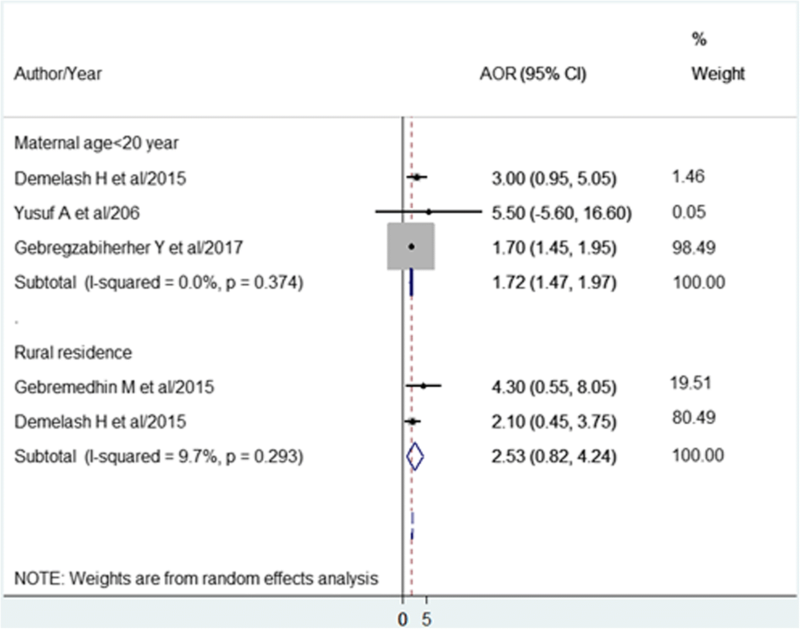 Therefore, this systematic review and meta-analysis was aimed, firstly, to estimate the pooled prevalence of low birth weight and secondly, to estimate the effect size of associated factors of LBW in Ethiopian context. The results of this review were reported based on the Preferred Reporting Items for Systematic Review and Meta-Analysis statement (PRISMA) guideline  (Supplementary file-PRISMA checklist) and, it is registered in the Prospero database: (PROSPERO 2017: CRD42017074407) Available from http: // www. Crd. york. ac. uk/ PROSPERO_REBRANDING/ display_record. asp? ID = CRD42017074407. Cross-sectional, case-control, and cohort studies were included. Those studies had reported the prevalence and/or at least one associated factors of LBW and published in English were considered. There was no restriction of the study period. Citations without abstract and/ or full-text, anonymous reports, editorials, and qualitative studies were excluded from the analysis. PubMed, Web of Science, Cochrane library, and Google Scholar were accessed. Articles with incomplete reported data were handled through contacting corresponding authors. The core search terms and phrases were “newborn”, “neonate”, “abnormal birth weight”, “birth outcome”, “underweight”, “low birth weight”, “Ethiopia”. The search strategies were developed using different Boolean operators. Notably, to fit advanced PubMed database, the following search strategy was applied: [(newborn [MeSH Terms] OR neonate OR infant OR child OR children AND (birth weight [MeSH Terms] OR birth outcome OR low birth weight OR very low birth weight OR underweight OR macrosoma OR big baby weight OR normal birth weight OR abnormal birth weight) AND (Ethiopia)]. Retrieved studies were exported to reference manager software, Endnote version 7 to remove duplicate studies. Three independent reviewers screened the title and abstract. The disagreement was handled based on established article selection criteria. Three independent authors conducted the abstract and full-text review. Three independent authors appraised the quality of studies. The Joanna Briggs Institute (JBI) quality appraisal checklist was used . The disagreement was resolved by the interference of third reviewer. The following items were used to appraise cohort studies:  similarity of groups,  similarity of exposure measurement,  validity and reliability of measurement,  identification of confounder,  strategies to deal with confounder,  appropriateness of groups/participants at the start of the study,  validity and reliability of outcome measured,  sufficiency of follow-up time,  completeness of follow-up or descriptions of reason to loss to follow-up,  strategies to address incomplete follow-up, and  appropriateness of statistical analysis. The items used to appraise case-control studies were:  comparable groups,  appropriateness of cases and controls,  criteria to identify cases and controls,  standard measurement of exposure,  similarity in measurement of exposure for cases and controls,  handling of confounder , strategies to handle confounder,  standard assessment of outcome,  appropriateness of duration for exposure, and  appropriateness of statistical analysis. Studies got 50% and above of the quality scale were considered low risk. The following items were used to appraise cross-sectional studies:  inclusion criteria,  description of study subject and setting,  valid and reliable measurement of exposure,  objective and standard criteria used,  identification of confounder,  strategies to handle confounder,  outcome measurement, and  appropriate statistical analysis. Studies were considered low risk when it scored 50% and above of the quality assessment indicators. Two independent reviewers extracted data using a structured data extraction form. Whenever variations of extracted data observed, the phase was repeated. If discrepancies between data extractors continued, third reviewer was involved. The name of the first author and year, the study region, the study design, the target population, the sample size, prevalence of LBW, and AOR of associated factors were collected. 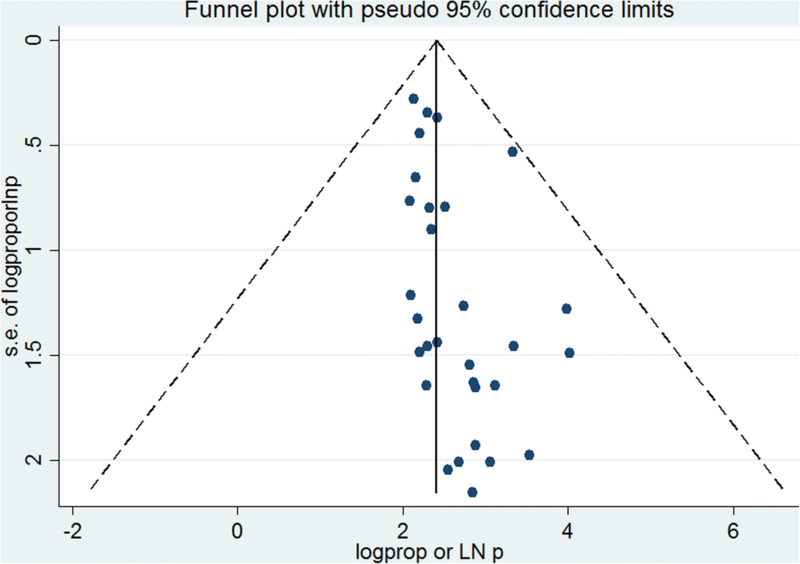 LBW was considered, when newborn weight recorded below 2500 g .
Publication bias was checked by funnel plot and more objectively through Egger’s regression test . Heterogeneity of studies was quantified using the I-squared statistic, in which 25, 50, and 75% represented low, moderate and high heterogeneity respectively [35, 36]. Pooled analysis was conducted using a weighted inverse variance random-effects model . Subgroup analysis was done by the study region, design, and year of publication. Sensitivity analysis was employed to see the effect of single study on the overall estimation. Besides, the time-trend analysis was conducted to check whether variations through time is observed. STATA version 14 statistical software was used for meta-analysis. The search strategy retrieved 288 from PubMed, 31 from Cochrane library, 13 from Web of Science, and 47 from Google Scholar. After duplication removed, 291 remained. 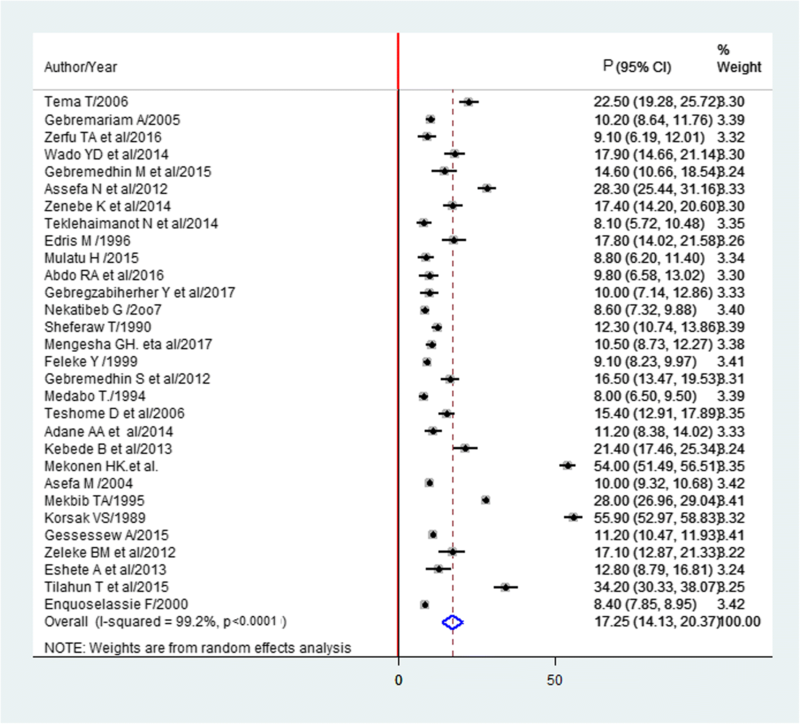 Finally, 41 studies were screened for full-text review and 33 were to the prevalence and/ or associated factors analysis (Fig. 1). Nine studies were found in Amhara region [38–46], ten in Oromia [47–56], six in Tigray [57–62], five in Addis Ababa [30, 63–66], and three in Southern Nation Nationalities and Peoples region (SNNPR) [29, 67, 68]. Twenty-two of the studies were done by cross-sectional study design, three studies by case-control study design, whereas eight of the studies were conducted through cohort study design respectively. Regarding year of publication, six studies were published before 2000, seven studies were published between 2000 and 2010, and 20 studies were between 2010 and 2017 (Table 1). The JBI quality appraisal criteria established for cross-sectional, case-control, and cohort studies were used. The studies included in this systematic review and meta-analysis had no considerable risk. Therefore, all the studies were considered [29, 38–72] (Table 1). A funnel plot showed a symmetrical distribution (Fig. 2). Egger’s regression test p-value was 0.063, which indicated the absence of publication bias. 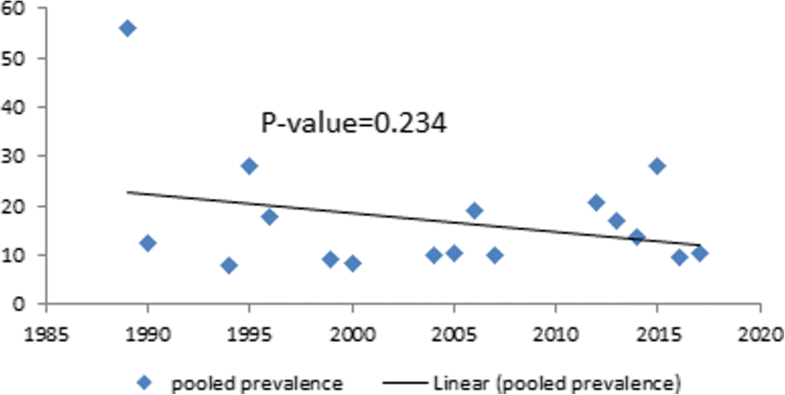 The estimated overall prevalence of LBW is presented in a forest plot (Fig. 3). The overall prevalence of LBW was 17.3% (95% CI; 14.1–20.4; I2 = 99.2%). The subgroup analysis based on the region, study design, and year was done. Based on this, the prevalence of LBW found to be 22% in Addis Ababa, 23% in the cohort studies, and 17.7% between the year 2010 and 2017 (Table 2). Mekonen HK et al. and Korsak Vs  had shown an impact on the overall estimation (Fig. 4). The time-trend analysis showed that the prevalence of LBW is decreased from 55.9% in 1989 to 10.4% in 2017. However, the pooled prevalence from year to year is not decreasing significantly (p-value = 0.234) (Fig. 5). 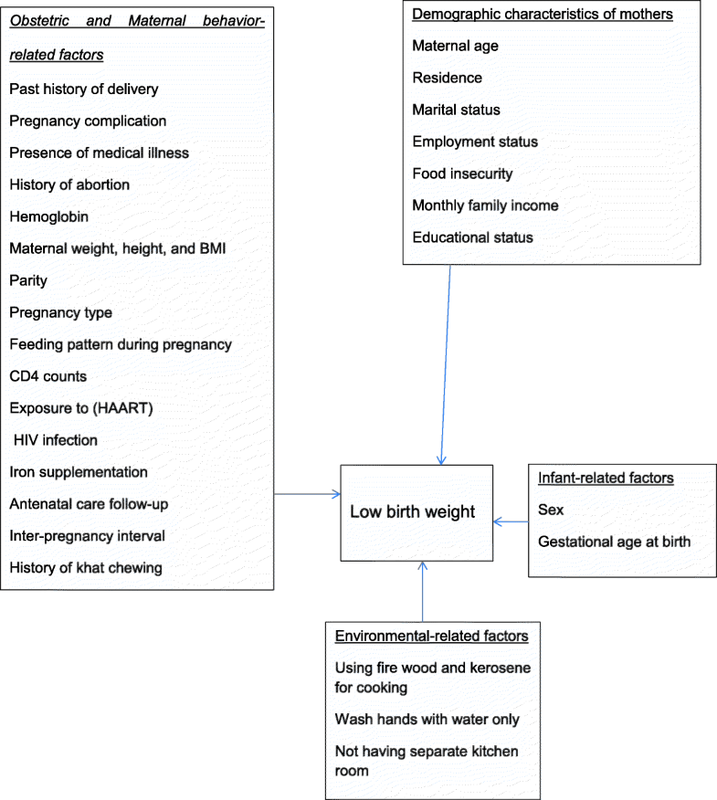 Based on this review, LBW in Ethiopian context is associated with socio-economic, obstetric and maternal behavior, infant, and environmental-related factors. Infants born from unmarried women (AOR = 10.5; 95% CI: 1.5–75.3) compared to married women , daily laborer women (AOR = 5.4;955 CI: 1.1–25.6) , and merchant (AOR = 0.1; 95 %CI = 0.02–0.52)  women as compared to house wife women were more likely to be LBW. Infants born from women who were on moderately or severely food insecure (AOR = 3.3; 95%CI: 1.0–10.3) , monthly family income ≤300 Ethiopian birr (AOR = 19.6; 95% CI:1.6–243.0) , and < 26 United States Dollarr (AOR = 3.8; 95% CI:1.5–9.4)  were associated with LBW. Besides, infant born from mothers with lack of formal education (AOR = 6; 95% CI: 1.3–26.9)  were higher risk to LBW. The pooled effects of three studies [46, 56, 60] showed maternal age < 20 years was a significant associated factors, wheras the pooled effects of the other two studies [56, 58] found residence of mother had no significant association with LBW (Fig. 6). Malaria attack during pregnancy (AOR = 4.9; 95%CI: 1.95–12.3) , history of delivering preterm or small baby (AOR = 8.4; 95% CI 2.4–29.4) , mothers who had no history of UTI and/or any documentation for bacteriuria during the current pregnancy (AOR = 0.1; 95% CI: 0.02–0.36) , women who had pregnancy complication (AOR = 4.39; 95%CI: 2.56–7.52) , presence of any chronic medical illness (AOR = 5.3, 95% CI:1.12–25.45), and mothers with a history of abortion 2.423 (1.744–15.317)  were associated with LBW. Infants born from mothers with normal hemoglobin (AOR = 0.017; 95% CI: 0.002–0.176)  were less likely to be LBW, whereas infants born from maternal anemia (AOR = 5.52; 95%CI: 1.62–15.85)  were more likely to be LBW. Maternal weight < 50 kg (AOR = 2.26; 95% CI = 1.06–4.80)  and maternal height < 1.5 m (AOR = 3.7; 95% CI = 1.22–11.28)  were also associated factors of LBW. 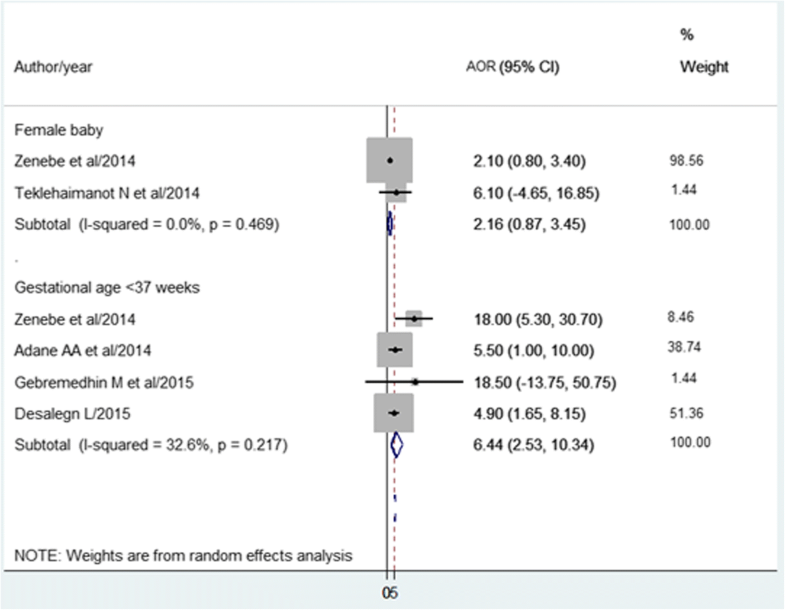 Primipara (AOR = 5.68; 95% CI: 2.20,14.66)  and unwanted pregnancies (AOR = 4.04, 95% CI:1.17–13.90)  were positively associated with LBW, where as mothers whose pregnancy was desired (AOR = 0.027; 95%CI: 0.004–0.207)  were less likely to deliver LBW infants. Those mothers taking extra meal during pregnancy (AOR = 0.249; 95%CI = 0.064–0.960)  were less likely to deliver LBW infants. Baseline maternal CD4 counts below 200 cells/mm3 (AOR = 4.24; 95% CI: 1.85–9.69), and 201–350 CD4 (AOR = 1.13; 95% CI: 0.53–2.37) as compared to> 350, and maternal exposure to Highly Active Antiret-roviral Treatment (HAART) (AOR = 8.26; 95% CI: 2.53–14.34)  were associated factors of LBW. One research showed  that those infants born from mohers who had history of khat chewing were higher risk (AOR = 6.4; 95% CI = 2.42–17.10) to be LBW infants. The pooled effect of maternal hypertension [38, 39], being HIV positive mother [41, 44, 60], iron and/or folic acid supplementation [60, 63], and absence of antenatal care [44, 56, 63] were not became significantly associated factors. Inter-pregnancy interval less than 24 months [46, 56] and maternal body mass index < 18.5 kg/m2 [40, 56] were associated with LBW (Fig. 7). Based on the pooled effects of two studies [38, 59], being female baby was not associated with LBW. The pooled effects of four studies [38, 39, 45, 47] showed that gestational age less than 37 weeks was positively associated with LBW (Fig. 8). 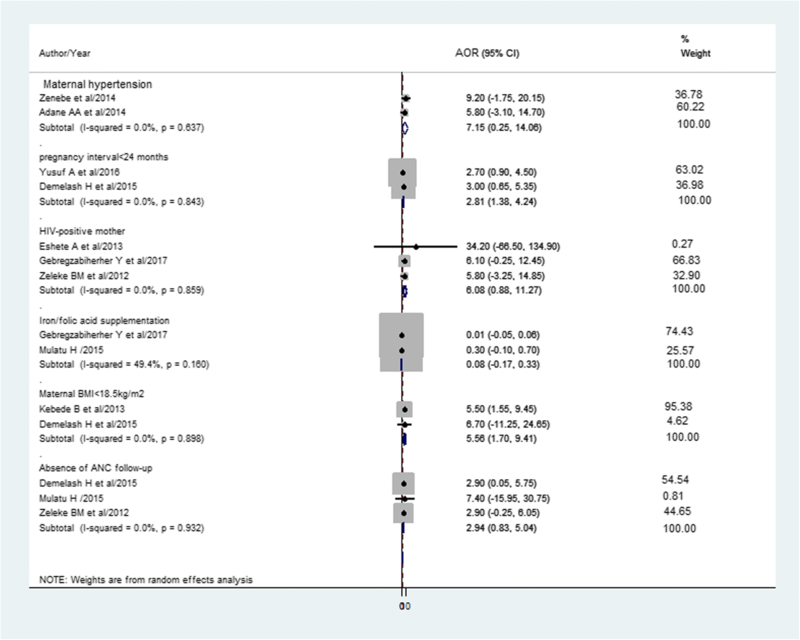 Another one study  showed infants’ gestational age 37–42 (AOR = 0.14; 95% CI: 0.04–0.47) and > 42 weeks (AOR = 0.13; 95% CI: 0.02,.68) were less likely to be born with LBW than < 37 weeks. Only one study  found, using firewood (AOR = 2.7; 95% CI: 1.01–7.17) and kerosene (AOR = 8.9; 95% CI: 2.54–31.11) for cooking, wash hands with water only (AOR = 2.2; 95% CI: 1.30–3.90), and not having separate kitchen room (AOR = 2.6; 95% CI: 1.36–4.85) were associated factors of LBW. Figure 9 shows the summary of associated factors of LBW. The Millennium Development Goal-4 was aimed to reduce mortality of under-5 children by two-thirds . It is continued to be one of the targets of Sustainable Development Goals; By 2030, all countries need to reduce neonatal mortality to below 12 per 1000 live births. For sub-Saharan Africa, the United Nation estimated 1 child among 12 dies before his or her fifth birthday that showed a great difference from developed countries, in which 1 dies among 147 children . LBW is one of the leading causes of neonatal morbidity and mortality. 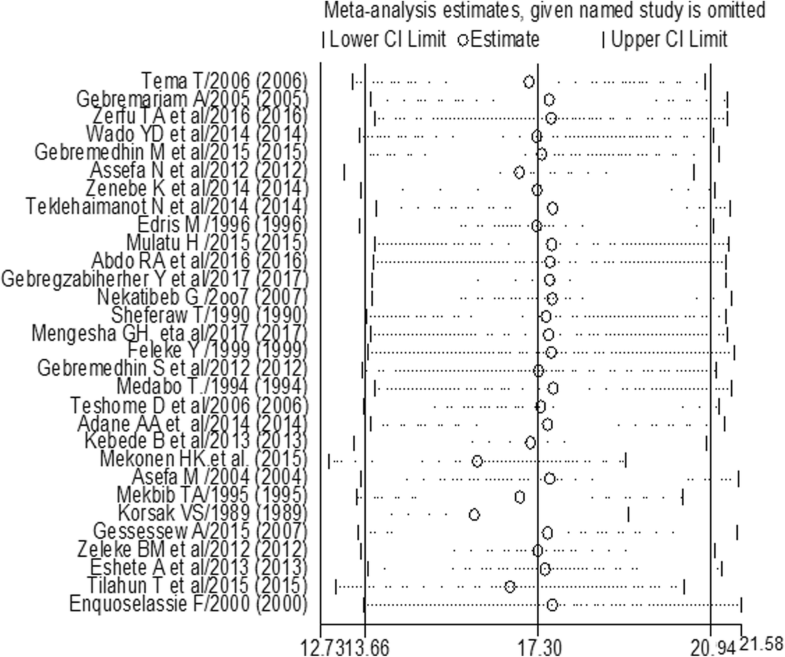 This meta-analysis was estimated the national prevalence of LBW in Ethiopia. Accordingly, the national pooled prevalence of LBW was 17.7% (14.1–20.4%). This result was higher than studies conducted in Indonesia (12.9%), Armenia (9.0%), and Tanzania (13.9%) . This might be due to high prevalence of home delivery, in which many of the newborn weight might not be recorded, high prevalence of teenage delivery with a lower physical and psychological preparedness for their pregnancy, and lack of full ANC coverage, in which services provided, like health education about nutrition, getting iron supplementation, immunization, reassurance to get mental comfort influence the weight of newborns in Ehiopia. Besides, the high prevalence of preterm delivery contributes to the high prevalence of LBW in Ethiopia. Furthermore, the time-trend analysis showed that the burden of LBW in Ethiopia was not decreased significantly. This might be due to a slow progress in the quality of healthcare services, like institutional delivery, postnatal services, ANC coverages, and immunization coverage still need further improvement. Moreover, many of the people are in low economic status that has impacts on maternal nutritional status before and during pregnancy and birth complication would be apparent as a result. Based on the subgroup analysis, the prevalence of LBW was high in Addis Ababa as compared to other regions. Those studies included in this meta-analysis were conducted in governmental hospitals and data from private hospitals didn’t found. In Addis Ababa, there many private clinics and hospitals are avail. The probability of those mothers who had middle and high economic income delivered at private clinics would be high. As a result, the prevalence of LBW might vary as well. Based on the pooled analysis of two or more AOR of studies, maternal age < 20 years, pregnancy interval < 24 months, maternal BMI < 18.5 kg/m2, and gestational age of the baby at birth < 37 weeks (preterm delivery) were associated with LBW. The odds of infants born from mothers whose age < 20 years were nearly two times more risk to have LBW. This finding supported by other studies conducted in Nigeria  and Brazil . This age group might be teenage pregnancy that mostly gives LBW infants usually due to unplanned and/or unwanted pregnancy, which leads to less attention to nutritional value and health care services utilization , lack of fair jobs, and a low level of knowledge of pregnancy’s danger sign and major risk factors  might be attributed to LBW in teenage pregnancy. Besides, pregnancy at this age might leads to stigma, social, and cultural malpractices during pregnancy and/or delivery time . The odds of infants born within < 24 months birth interval were nearly three times to have LBW. This finding was in lined with a study in Sudan , Qatar , Iran , China , and United States . The possible explanation might be due to short birth interval could result inadequate replenishment of maternal nutrients due to the physiologic depletion of folate that occurs in pregnancy and lactation, which result a negative impact on the growth of the fetus. Those mothers who had BMI < 18.5 kg/m2 were more than five times risk to give LBW infants. Studies from Japan , China , and Thailand  are inagreement with the current finding. Mothers’ BMI is one of the best parameters to assess nutritional status. Those mother who had BMI < 18.5 kg/m2 indicates the presence of chronic malnutrition, in which fetal growth might be impaired. Therefore, LBW could be easily happen. Poor maternal nutritional status during pregnancy has also been associated with reduced placental weight and surface area, which could limit nutrient transfer from the placental circulation to the fetus. Moreover, undernutrition of mothers might leads to a reduction of serum concentrations of hormones, like leptin and estrogen, which results fetal growth impairment. The odds of being premature birth was six times higher risk to be below normal birth weight. The finding from another study in India , Iran , and Brazil  also showed the positive association between premature birth and LBW. The several organ systems of human fetus usually become mature by the end of 37 weeks of gestation . Therefore, those infants born before 37 weeks would have LBW more than that of babies born after 37 weeks of gestation. This study identified important risk factors with independent effects on the burden of LBW in Ethiopia. National and regional policy and decision makers have work to improve these specific risk factors. Different strategies with appropriate community-based interventions on these factors need to be considered for improving overall child health in Ethiopia. This systematic review and meta-analysis is the national estimation conducted in Ethiopia. It may be lacked national representativeness because no data were found from Benishangul Gumuz, Afar, Gambella, Somalia, Dire Dawa, and Harare regions. Time-trend analysis might not reflect the exact trend because all the years didn’t have reported data. The prevalence of low birth weight in Ethiopia remains high. This review may help policy-makers and program officers to design interventions on preventing low birth weight. There is no received grant from any fund agency. AE conceived and designed the study. AE and MAT established the search strategy. All the authors read the manuscript before they have given the final approval for publication. Not applicable because no primary data were collected. World Health Organization. Global Nutrition Targets 2025: Low birth weight policy brief. Geneva: 2014. Available at https://www.who.int/nutrition/publications/globaltargets2025_policybrief_lbw/en/.